Be it the owner of an apartment or a villa in Bangalore, decorating isn’t highly necessary. People often stick to the traditional method of decorations as they do not have time to explore the other options. The same thing happens in the case of a window curtains or blinds. People always stick to one model of curtains and they do not even know that there are different kinds of curtains and covers. Curtains are primarily cloth based and are mostly used in areas where there’s a lot of light. They are also used for a better look in areas like the hall, bedroom etc. There are also options of two layer cutains wherein one layer is a sheer or lace version and the next layer is a thicker material. Where there are two layers as one is supposed to be translucent and the other is supposed to fully block the light for coming in. A bathroom without curtains looks incomplete. The shower curtains protect the bathroom floor from becoming wet by the splashes of water during showers. There are also various kinds of curtains depending on the material and design. Blinds are usually used in the study area or office as it gives a much more formal look to the entire room. Let us start with the roller blinds which are simple and sweet. The roller blinds moves up vertically when opened and rolls down to the floor to cordon off the sun and outward glances. Next comes the Vertical blinds wherein the hanging slots are connected together on a channel. Vertical blinds are best suited for long spans where one cannot fit a single blind without joints and intervals. 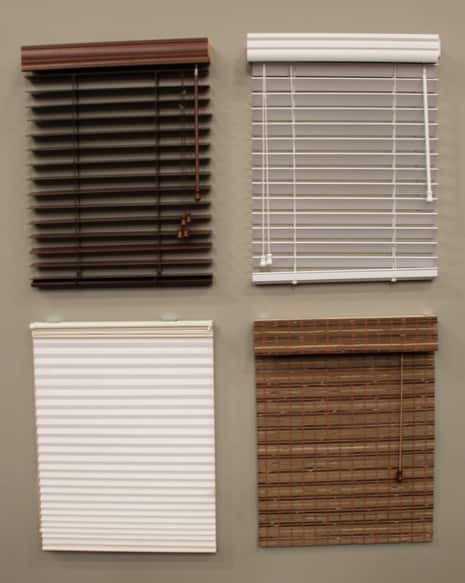 Similar to vertical blinds, we can also find horizontal blinds. Apart from this, there are other blinds based on materials like wood, cloth, bamboo etc.